This recipe for Stir-Fried Green Beans with Lemon, Parmesan, and Pine Nuts is a delicious way to use green beans from the garden, and these tasty green beans are low-carb, Keto, low-glycemic, gluten-free, and South Beach Diet friendly. Use the Diet-Type Index to find more recipes like this one. 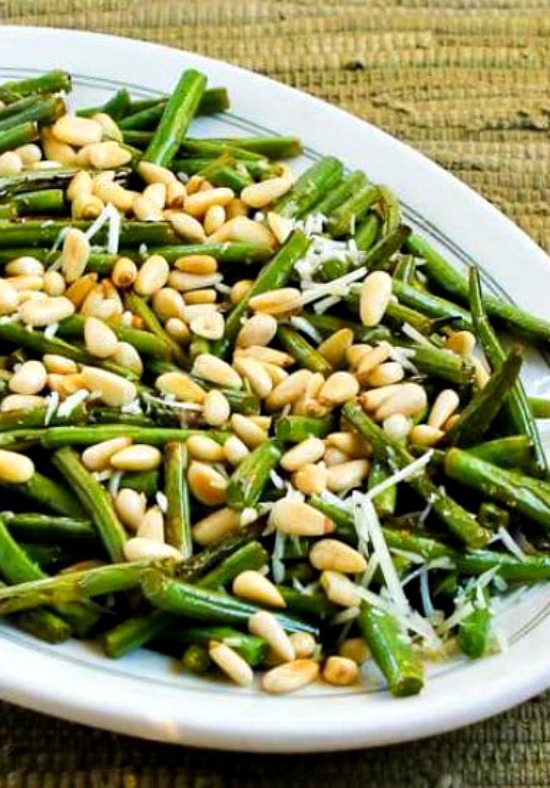 Click here to PIN Stir-Fried Green Beans with Lemon, Parmesan, and Pine Nuts! When you’re writing a home cooking blog, you’re not only sharing your recipes with the world, you’re also documenting what you’re eating. When I first posted this recipe for Stir-Fried Green Beans with Lemon, Parmesan, and Pine Nuts back in 2007, green beans weren’t something I cooked that often. Then I discovered those those lovely thin French green beans at Costco, which not only inspired me to make this recipe but also got me started growing my own green beans in the garden. If you have green beans planted this year, before long you’ll have more green beans than you ever imagined, so let me recommend this new way to cook them. Look after the recipe for ten more delicious ideas for green beans from Kalyn’s Kitchen and some of my blogging friends. Trim the beans into pieces about 2 inches long (and wash if you’re using garden beans.) Put the green beans in a bowl, cover with cling wrap, and microwave for 2 minutes. While the beans cook in the microwave, zest the lemon and squeeze the juice. Get the garlic and Parmesan ready and toast the pine nuts in a dry pan just until they’re barely starting to brown. Heat the oil in a large wok or heavy frying pan, then add the garlic and cook about 1 minute, or until fragrant; then discard the garlic. (This is called “seasoning the oil.”) Don’t let the garlic brown. Add the green beans and stir-fry over high heat until they are just starting to brown, but are still slightly crisp. Taste one to see if it’s as done as you’d like it; thicker garden beans will take slightly longer. Lower heat, add the lemon juice and stir to get that flavor mixed in with the beans; then turn off heat and sprinkle the lemon zest and Parmesan over the beans. Serve hot, sprinkled with the toasted pine nuts. Make it a Meal: Stir-Fried Green Beans with Lemon, Parmesan, and Pine Nuts would be great with something like Baked Swedish Meatballs for a low-carb meal. This recipe for Stir-Fried Green Beans with Lemon, Parmesan, and Pine Nuts is a delicious way to use fresh green beans from the garden. Cut beans into pieces about 2 inches long. Put beans into glass bowl, cover with saran wrap (cling film) and microwave on high 2 minutes. In a dry pan, toast pine nuts over high heat 1-2 minutes, until they barely start to brown. Set aside. Heat oil in wok or large frying pan over high heat. Add garlic cloves and stir fry about 1 minute. (This is a Chinese cooking technique called seasoning the oil.) Be sure not to brown the garlic or it will taste bitter. Lower heat, then pour lemon juice over beans, and stir beans a few times. Turn off heat, then sprinkle lemon zest and Parmesan cheese over beans and stir again. Recipe inspired by A Veggie Venture. 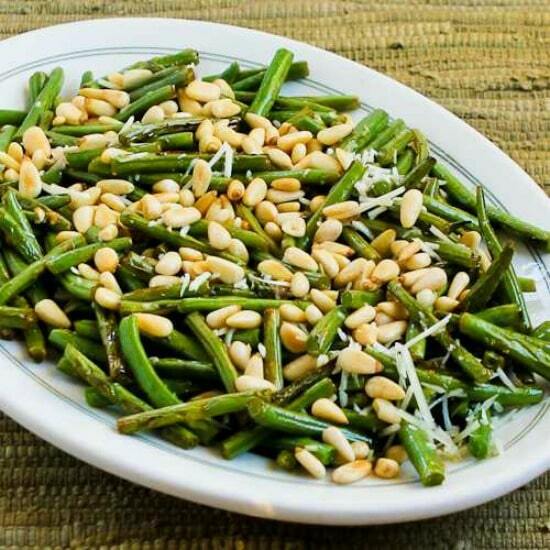 Stir-Fried Green Beans with Lemon, Parmesan, and Pine Nuts would be a perfect side dish for any phase of the South Beach Diet as well as most low-carb diet plans.